American Specialty Health Insurance Company is known as American Specialty Health Incorporated, or ASH. 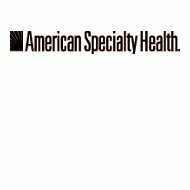 Through its subsidiaries, American Specialty Health offers an assortment of health insurance, wellness and prevention strategies, and fitness and exercise programs. ASH also manages a network of complementary healthcare providers; including chiropractors, massage therapists, and nutritionists. This is a great place to find health insurance! Type in your zip code and look at all of the different health insurance quotes just for you. American Specialty Health is a national health and wellness organization that provides workplace wellness programs to employer groups, insurance carriers, trust funds, and health plans across the United States. The company has more than 800 employees and helps more than 25.9 million members. One of the products that American Specialty Health offers is complementary healthcare. On its website, ASH explains that one of its goals with complementary healthcare is to teach members and customers to take care of themselves and to learn to utilize complementary healthcare to manage pain and improve their overall health. ASH offers this product for health plan providers as well as directly to employers to offer to their employees. Complementary healthcare is “complementary” to the usual annual visit to a traditional doctor or treatment for a recurring back injury at the hospital. ASH subsidiaries have become some of the largest specialty health plans, insurers, and network administrators for complementary healthcare, including chiropractic, acupuncture, massage therapy, nutritional counseling, physical therapy, and occupational therapy. ASH’s network has more than 22,000 practitioners of these complementary healthcare techniques. Another product that American Specialty Health offers is its HealthyRoads® wellness and prevention program. HealthyRoads® serves more than 170 clients and has more than five million members. HealthyRoads® consists of a variety of programs that can be offered alone or combined into a robust health and wellness plan. This includes marketing material to promote the program at a workplace, including postcards and payroll stuffers. It also includes an online portal where a member could access tools such as daily wellness tips, a menu/nutrition planner, and a personal health assessment. The HealthyRoads® program can also include a LifeStyles coach via telephone or one-on-one coaching at a workplace; a rewards or incentives-based program; and challenges and competitions, such as a weight loss contest. HealthyRoads Connected!™ is a wireless activity monitor that is used to promote exercise, and worksite biometric screenings can help to monitor an employee’s cholesterol, blood pressure, and other measurements. American Specialty Health also offers many different fitness and exercise services. These include Web-based tools, discounts at local gyms and fitness clubs, and no-cost, at-home walking programs. All of the products that American Specialty Health offers are designed to keep people healthy, so that they have less need for traditional healthcare. American Specialty Health was started in 1987 in Southern California as a chiropractic network and management company. In 1989, the company opened its first office in San Diego, and expanded through California in 1990. By 1997, ASH was licensed to offer acupuncture as a part of its specialty plans and it had 2.3 million customers. By 2000, American Specialty Health had provider networks established in all 50 states. ASH’s HealthyRoads® for Living program was rolled out in 2002, with a HealthyRoads® for Kids program introduced four year later, in 2006. By 2010, the healthcare company covered 17.9 million members across the entire United States, and the company had expanded to new headquarters in San Diego. ASH lists the various job positions available at its San Diego campus on its website. These range from account executive to staff accountant. The company also recommends that interested applicants attend a job fair at its San Diego headquarters. As you might imagine, American Specialty Health offers its own wellness programs to its employees. These include the HealthyRoads® program and coaching for weight management, smoking cessation, and healthy living. The company offers an onsite workout room, healthy vending machines, complementary healthcare such as acupuncture, incentives programs for fitness, and health challenges. Magazines have lauded the company, including being designated one of the 15 Fittest Companies in America by Men’s Fitness magazine, and one of the 100 “Best Places to Work in Healthcare” by Modern Healthcare magazine. Enter your zip code on this page and you will be able to find health insurance quotes for your area. they don’t have a good network, all the good doctors I knew are not on their list. This is a terrible insurance company. They deny most of chiropractic treatment coverage and say it is not a necessity and that’s where they get their provision. Customer service won’t deal directly with the patient. They care nothing about the patients or the providers in their network. Their customer service is beneath lousy. They create confusion, fail to follow through, and pass the buck. Their mission statement should read, “Disrupting Care for Profit”. The worst Insurance company I have ever dealt with. They are not worth getting 1 star. This company should be fined and the owners should be put in jail. They take your money then deny services to the patient. They interfere with Doctor-patient relationship. Do not get Chiropractic benefits from this company, its a scam. They only cover 5 visits and the doctor has to fill out forms that can easily take several hours to fill out, and then they still deny it. Patients should be furious with them, they take your insurance premiums and then don’t cover your care. Getting ASH to pay your doctor’s bills is actually harder than getting blood from a stone. They have mastered the art of stonewalling. Don’t expect anything from them- they will not pay your bills.